14/08/15 - Welcome page, Clubs - Bushnbury venue change. 07.05/14 - Welcome page - Division 2 play-off, Mike Biddle email. 29/03/14 - Welcome page - Summer League & League Management meeting. 15/10/13 - Welcome page - Shropshire congress. 25/07/13 - Welcome page - Birmingham and Coventry congresses. Sutton Coldfield Chess Club will be meeting in the Lounge of Minworth Social Club, Robinsons Way (off Water Orton Lane), Sutton Coldfield B76 9BB. Same night and start time (Mondays 7.30pm) so fixtures are unaffected. Patrons requested not to bring their own food or drink. The Bowman Pub has been sold to the Co-Op, to be turned into a shop. It will close immenintly. Parking at rear, Broad Lane or in the church car park opposite. This will commence immediately so will include the Walrus Trophy on may 20 th and all Summer League matches. Please let yor players know. "Although I am proud of my 17 BDCL Individual Finals & the record-breaking 7 game semi-final tussle against Gary Hope in 2002, I think Terry Walker has surpassed that. Terry won the division 4 individual final in 1969 & has reached (won) another final 2019. 50 years apart - a truly remarkable record!" The Rules subcommittee met on 5th March to consider a dispute, the ruling is given here. The Birmingham League's annual Team Lightning Tournament will take place at Olton's venue, Tyseley Working Mens Club, Warwick Road, Tyseley, Birmingam, B11 2EX, on Tuesday 12th March. Teams of 4 or 5 players will compete in graded sections at the rate of 10 seconds per move. Matches will be played over 4 boards. Entry fee £6 per team, payable on the night or in advance to John Mildenhall lightning@birminghamchess.org.uk. At least 80% of entry fees will be returned as prize money. Team lists to be submitted by 7:15pm on the night, Play to commence as soon as possible after 7:30pm. If you can't raise 4 players, come along anyway, we will be able to form extra teams on the night. The entry form and details of this upcoming congress are on a PDF document here. Nominations for the 2018-19 Ritson Morry award for the outstanding Junior player, and score entries for the Baruch Wood best game must be submitted by 31st March 2019. Send e-mail submissions to morrywood@birminghamchess.org.uk. The entry form for the Ritson Morry award can be accessed at http://www.birminghamchess.org.uk/Youth_entry_form.htm or by following the Morry-Wood link on the left-hand side of the BDCL web site. Games submitted for the Baruch H Wood award must show the date when played, the players’ names, the competition (eg BDCL div 4), and the venue. The 26th Rapidplay will be neld on Sunday 31st March at Quinborne Community Centre, there will be sections for Open, Under 170, Under 140 and Under 110. More information and entry details can be found on the Rapidplay page. Tim Lane, Hon. Gen. Sec. It is with great sadness that we have to report the passing of our WDCL Tournament Secretary and Auditor Derek Perks on Thursday 18th October 2018. Our sympathies and thoughts go out to his family at this sad time. A full obituary can be found here . Derek's funeral will be held at Gornal Crematorium on Wednesday 14th November at 11am and there after at the Dudley Arms in Himley. Nigel Short, son of Lichfield secretary and former Birmingham League president David Short, has been appointed a Vice President of FIDE. Peter Thompson will be acting as Club Secretary for Mercia for the remainder of the current season. Peter can be contacted at pithompsonj8@gmail.com and on 01902 765870. The individual Knock-out tournaments are now in graded bands rather than divisions. Anyone wishing to enter should contact Tim Lane, the closing date for entries is 1st October. Revised rules are contained within the BDCL Rules. There is a 15-round Swiss at Quinborne on 8th September, which is a qualifier for the National Final. This years winners and photos from the AGM have now been added to the honours page.Images are compressed, if winners would like a copy of the original, i can email it, also some photos not shown are also available. The winners of these two league awards for best game and the Junior prize have been announced. See the Morry-Wood page for more details. This tourney took place at Mutual Circle's venue on Tuesday, 24th April. There were 25 entrants (9 from Mutual and 14 from outside) playing in two separate 6-round tournaments. In the 'Open' Henrik Stepanyan from Sutton Coldfield club came out on top with 5/6. He thus won the £35 first prize and the Mike Walker Cup for one year. Second equal on 4 points came Nick Walker and Moin Uddin from West Bromwich, Kevin Hurney of South Birmingham and Matt Harborne from Mutual. These four shared the £20 second prize. The 'Grading' prize was won by Phil Bull of Wolverhampton, graded, 157, with 3 1/2. (Technically Moin Uddin, above, should perhaps have been awarded this prize but he opted to take the less lucrative joint-second prize instead). The 'Challengers' (Under 136 grade tournament) was even more hotly contested and finished with three joint-winners on 4 1/2 out of 6: John Freeman of Shirley & Wythall, Florin Valea of Warley Quinborne, and Giles Stanton from Redditch - who all won £20 and a share of the Challengers' Trophy. Tan Husain, graded only 43 (! ), was the undisputed winner of the Grading Prize as he achieved a stupendous score of 3 1/2 points. Most participants seemed to find the tourney enjoyable. The 'Challengers' event was almost de-railed by a computer-operator error after Round 4 that made it impossible to continue with automated pairings! Fortunately the evening was saved by the Mutual Treasurer, Robert Hollows, who proved to be masterful at sorting out the pairings manually. Robert Bellin on weak squares and outposts, Redditch 22nd May. There are some spare spaces for our next in the series of Robert Bellin talks. This takes place on Tuesday 22nd May at Redditch from 7.15 until 10pm with an interval somewhere in the middle. It‘s on weak squares and outposts. His last talk on knight endings was excellent. I won at least two games I probably wouldn’t have after attending. Places can be booked with Nigel Towers, nigelst123@hotmail.co.uk, or through me. Details of the Individidual Lightning tourney that will take place at Mutual Circles' venue on Tuesday, 24th April appear here. This event is held in memory of former Hon Gen Sec, MIke Walker. Please would you circulate details to your members. I also give brief details in the text below. January Rapidplay gradings will be used whenever available, but in their absence January Standardplay gradings or older Rapidplay gradings (from 2016 onwards) will be used, in that order of preference. Ungraded players can enter the Open or may be accepted for the Challengers where there is clear evidence of playing strength. Entries will have to be limited to a maximum of 40 but I will be happy to receive 'reservations' of a place by phone or email as long as these are from players who are confident that they will be attending. The 7.15 p.m.start time given is for registration of entrants but I would like to get the event going as near 7.30 p.m. as possible. Let me know if you have any queries. To try to avoid disputes and problems I shall be producing an info sheet giving in more detail the rules and procedures which will apply to the event. This will be available to view on the night of the tourney but can be sent in advance to interested parties. Mike Groombridge reports that Midlands chess stalwart Graham Humphreys sadly passed away on Wednesday in New Cross Hospital, aged 89. Graham was a long-time organiser of chess events in the Birmingham and Wolverhampton areas. Coventry Chess Club are looking to recruit strong players to play for us in Division 1 of the Coventry Chess League. Coventry Chess is a friendly club, based at Massey Ferguson Social Club, Coventry. CV5 7NL. We play matches on Tuesday evenings, starting at 7.30pm. These take place between October and March, mainly in the Coventry area, and occasionally in Kenilworth, Rugby and Nuneaton. Lifts from Tile Hill or Coventry train stations may be possible. If interested, please contact Dave Ireland at d.j.ireland@outlook.com. Nominations for the 2017-18 Ritson Morry award for the outstanding Junior player, and score entries for the Baruch Wood best game must be submitted by 31st March. Sutton Coldfield Chess Club now meets Mondays AND Thursdays after 7pm. The match night is still Monday. Thursday is more informal for mini-tourneys or talks, etc. Entries are now being accepted for the 24th Birmingham Rapidplay to take place on Sunday 25th March 2018. Details are on the Rapidplay page. There is a qualifier for the British Blittz Championship 2018, details of which are here..
Mutual Circle Secretary Chris Evans has moved house and is now at 30 Drew Crescent, Pedmore, Stourbridge, DY9 0UX. It is with great sadness that I report that Olton Chess club member Bramwell Garner passed away on Sunday 1st October, after an extended illness. Bramwell and I were both suffering from eye problems in August 2016 and discussing our experiences. In the event, it was found that Bram's problems were due to an untreatable cancer. Bramwell had played for Olton Chess Club over the past 40 years, stopping on a couple of occasions due to personal circumstances. His last stint was the longest by far and he competed in many club tournaments, Birmingham League and some Leamington League matches. His placid nature and sensible attitude often won the day when there was potential for dispute and his love of chess came through in his efforts over the board, regardless of the strength of the opponent. Bram was always willing to step in if the team was a player short. Missing a Tuesday at the club was unthinkable, although he did enjoy extended holidays in warmer locations over the winter in the latter years. Bram's funeral will take place at Yardley Crematorium on Thursday 19th October at 1.00pm, then there will be a gathering at Holy Souls club, Warwick Road, Acocks Green. Our thoughts are with Bram's wife Sue and their family at this sad time. Congratulations to the Halesowen Chess club on being awarded ECF club of the year 2016-17. The club's winning of the Birmingham League Title no doubt contributed to the decision. A number of changes to the laws have come into effect in advance of the 2017-18 season and are listed here. All players in the League should be aware of them. Lee Collier informs us that the Birmingham & District Chess League was formed on this day in 1897. Several last minute changes to the teams in the lower Divisions have been agreed. New/moved teams will be contacting existing teams regarding fixtures. D.R. Thomas, Flat 9 Normid Court, 35 Woodstock Road, Moseley, Birmingham, B13 9BD. To be held on Sunday 15th October 2017 at the Quinborne Centre. 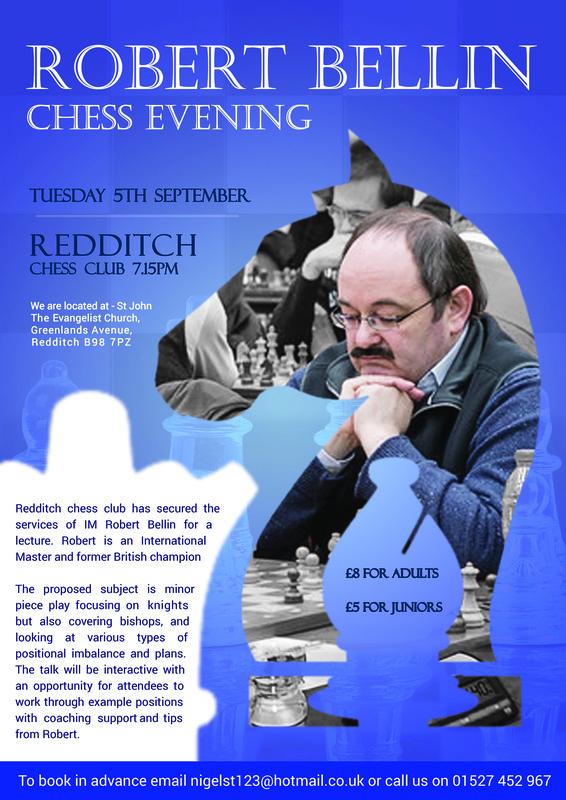 Details are now on the Rapidplay pages..
Redditch chess club have organised an evening with IM Robert Bellin on Tuesday 5th September. The subject of the talk will be Minor piece play. Details are here in Word format. Here is the event poster by Toni Reed. Rapidplay Congress on September 10th. The Honours page is being updated following the League AGM. South Birmingham have organised a Rapid play tournament taking place on Saturday 2 September 2017, details of the event are here. Entry form from here..
Gren Morgan informs me that Kynoch C.C was formed in 1937 and is celebrating 80 years in existence. Results for the 2016-17 Morry-Wood awards have been announced and are available on the Morry-Wood page. The Rules committee met to discuss a recent dispute and a report of the ruling appears here. Fixtures for the Summer League have been circulated to all captains. If any captain has not received them, please contact David Thomas. The rules of this year's summer league are here..
Redditch Chess Club has secured the services of Grandmaster Jon Speelman for an evening on the theory and practice of pawn, rook, and minor piece endgames. Jon was British champion in 1978, 1985 and 1986, fourth in the FIDE world ratings in 1989, and twice played in the Candidates matches. You may remember when Speelman used his phenomenal endgame skill to beat Gary Kasparov in a quickplay game (see links below). Our venue has the capacity to include people from other clubs for this event. The cost per person is £14 and we are now taking reservations from local clubs on a first come first serve basis for the spare places. To reserve places please complete the attached form and email it to me with attendees from your club. To reduce administrative effort we would prefer to take a single payment from each club - either in cash (or by cheque made payable to Redditch Chess Club) and preferably in advance - to cover the attendees from each club. We hope this is of interest to your club, and as above please do reply with the completed form as early as possible, so that we can reserve your club's places at the event. Enquiries to Michele Clack, email address on the form. 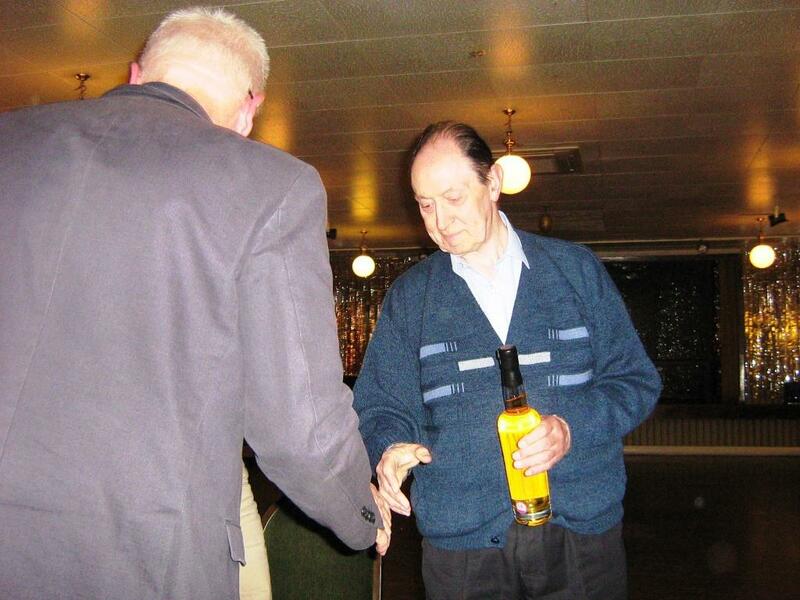 It’s my sad duty to report the passing this morning of Colin Thomas, President of Boldmere Chess Club. I don’t think Colin would have been too upset if I described him as not being a strong player, but that was not his great forte. His real strength lay in his willingness to help with the running of the club and he was a captain of at least one team per season every year, often not playing himself in order to give someone else a chance. For many years, until relatively recently, he was a Governor at a local junior school and ran their chess club. Over a number of years he trained many pupils and some became strong enough to take part in regional competitions, much to his great pride. Colin had to overcome physical disability and, in the last few years a number of medical problems. Unfortunately, in the last 6 months he became too ill to attend the club and has been sorely missed. The club would like to extend our sincere condolences to his wife and family. This was held at Olton's venue on Tuesday 7th March. Details are given here. Photos to appear shortly. Nominations for the 2016-17 Ritson Morry award for the outstanding Junior player, and score entries for the Baruch Wood best game must be submitted by 31st March. Games submitted for the Baruch H Wood award must show the date when played, the players names, the competition (eg BDCL div 4), and the venue. The next Birmingham Rapidplay Tournament will be held on Sunday 26th March at Quinborne Community Centre. Details and entry forms are on the Rapidplay page. 10/01/2017 - Geof Harris memorial service. A memorial service was recently held for Geoff, who passed away last May. Details are given here. Geoff was involved mainly in the Worcester Leagues but also the BDCL. The tournament is on 25th and 26th February at the Coventry Rugby Club. There are open , Under 170, Under 145 and Under 120 sections. It is my duty to relay the very sad news that Shirley and Wythall Chess Club elder statesman Gabor Csepregi died of cancer two weeks ago. No other details, including funeral arrangements, are known to us at this time. Gabor had been a member of Solihull Lodge Chess Club since it started in 1970, and served with distinction as Club Treasurer for more than 30 years. He remained constant through all the changes of club name and venue, to our current identity as Shirley and Wythall Chess Club. As a player, he had a vast array of openings knowledge and theory, and was always willing to debate the merits of different variations. On his day he was a tricky player, and on any day a doughty opponent. In his personal life, he was a very private person, with a rich love of family and his homeland Hungary, where he visited family often. He was also determinedly independent, and in recent months, although clearly quite ill and in some discomfort, neither complained nor asked for help. Typically he did not want any fuss. For myself, and for many in the club this is a great sadness. He will be remembered fondly. There will be a funeral ceremony at Robin Hood cemetery at 0930 on 5th January, followed by the scattering of his ashes. All chess playersa who knew Gabor are welcome to attend. His family will be attending a simultaneous service in Hungary. Full results are on the Rapidplay page. The Warwickshire Junior Championships will be played at Arden Academy on Sunday, 13th November. There are sections for players aged Under 8, 10, 12, 14, 16 and 18. Following a meeting of the Rules committee, item 4.1 of the guidelines for captains has been modified. This is due to the narrow band of games giving a distorted measure of strength. St. Georges have withdrawn from Division 5. Secretaries should adjust their fixtures accordingly. Jonathan Swallow died in Belfast on May 31 aged 63 after suffering from motor neurone disease. Born in Ilkley, West Yorkshire, Jonathan was awarded a scholarship to Hertford College, Oxford, in 1971, where he read philosophy, politics and economics, before taking a master’s degree in politics at Strathclyde University. In 1983 he was appointed as a principal officer at Birmingham city council. He played for West Midlands Municipal Chess Club in the 80s & 90s and won the club Championship twice - in 1989 & 1999 and won the WMMCC Lightning Tourney 3 times. His last game for WMMCC was the 2000 Townshend Final in a 3.5-2.5 victory. He moved back to Ilkley and played chess for Ilkley and Yorkshire and also worked in Northern Ireland. Jonathan is a sad loss to the chess community at such an early age. Many members of the BDCL will remember Ron Hardy, who had played in the League since at least the 1958-59 season, when he was runner-up in the Division 4 individual event as a member of the Lozells club. I believe he subsequently played for St. James until they folded, before coming to South Birmingham. Sadly I have heard that Ron passed away on 12 July. His funeral will be held at the Beacon Church Centre, Whetty Lane, Rubery, B45 9DL at 11.30 on 17 August. The old site address is currently defunct but may return later. The 9th 4NCL FIDE Rated Congress will be held over the weekend of Friday 8 - Sunday 10 July 2016 at the Park Inn, Birmingham West, West Bromwich, B70 6RS. The League AGM took place on Monday 13th June at South Birmingham. Winners were presented with their trophies and Chris Evans was elected League President for a 1 year term. Honours and Officers pages have been updated. Monday 13th June at 12noon at St Wulstans R.C. Church, 32 Vale Rd, Stourport, DY13 8YL (Followed by cremation) At the crematorium it is close friends and family only please. People can go straight to the Wake at Bewdley Pines from church, they will be expected. Family flowers and donations to Bewdley Medical Centre and The Mesothelioma Society. Results of the competition are given on the Morry-Wood page. Congratulations to the winners. The winning game is also published. Walsall Kipping Chess Club have organised a simultaneous display by Grandmaster Keith Arkell at their club on Thursday 12th May, 7:30pm. There are a few spaces left if any Birmingham League players wish to take part, it is first-come, first-served. Entry is £15 per player, these should be made to David Anderton, davidanderton41@gmail.com. A Rules committee meeting took place on Monday 11th April at south Birmingham Chess club. A report onm the meetings findings is given here.. Entry forms and rules are now available for the Birmingham Summer League from the Rules & Docs Page. Best wishes to Chris for his chess-free future! Report of the Rules Committee meeting held on Monday 25th Jan 2016 at South Birmingham C.C. Olton claimed that they had not been informed of the date of this cup match. Terry Hare-Walker (South Birmingham) stated that he informed Robert Reynolds (Olton) of the date of Wednesday 13th January verbally at Olton on 2nd December. Robert Reynolds denied that this happened. Rule 5.4(f) states that “Clubs are instructed to contact one another to confirm the playing arrangements”. Olton, for various reasons, decided not to contact South Birmingham to find out the date chosen for the game. On the Thursday before cup week, Olton claimed the game by default and then South Birmingham re-stated the date chosen for the match. Olton also disputed the ruling by the Hon. Records Secretary not to accept their claim for a win by default. South Birmingham also claimed the match by default when Olton failed to appear on the date they had specified. The committee rejects Olton’s claim that the Hon. Records Secretary was at fault in not accepting their claim. The committee finds it disappointing that two experienced club officials have failed to comply with Rule 5.4(f) which has worked successfully for at least 25 years. The committee finds that both clubs failed to comply with Rule 5.4(f) and orders that the game be played on Wednesday 24th February 2016 at South Birmingham. Nominations for the 2015-16 Ritson Morry award for the outstanding Junior player, and score entries for the Baruch Wood best game must be submitted by 31st March. To enter, you can do so online or download the online entry form. Both are available online. Please note Dudley Council have now decided to close Rye Market multi-storey car park on evenings and it is therefore not available for players visiting Stourbridge. Tesco’s car park is also reduced from 3 hours parking to 2 hours, so this is unsuitable. Road side parking in High Street, Lower High Street or Market Street remain available. This year's Birmingham Rapidplay will take place on Sunday, 11th October at Quinborne Community Centre. There are four sections for players of all abilities, and over £1,000 in prizes.For more details, including the entry form and online entry, please click here. Entries are now being accepted for the six Individual knockout tournaments. These should be sent to John Mildenhall lightning@birminghamchess.org.uk giving name, address, email and telephone number. Entry fee is £3.00, payable to the Birmingham & District Chess League.The closing date for entries is 1st October. Rushall Chess Club have entered a team in the league after a few season's absence. They are playing at the Rushall Olympic Football Cub, Dales Lane, Rushall, WS4 1LJ. More information about the club is available on the Rushall page. The PDF ("BDCL Rules changes assistance 2015-16"), written by John Fahy, provides guidance for captains and players on the implementation of the new Rule. The Word document ("Setting a DGT 2010 to the new Birmingham League Incremental Time Limit"), written by Alex Holowczak, covers pretty much exactly what its title indicates. Also produced by Alex is a video showing how to set the clocks. You can view this at https://www.youtube.com/watch?v=vOBfVROW6zA. Although none of these are "official" BDCL offerings, they have been reviewed by a number of members of the Management Committee, and we're hopeful that they'll help Clubs prepare for the start of the new season and get off to a smooth start. These documents & links have been added to the Rules & Docs Page. The League rukes as amened at the end of last season have been updated and are under Rules & Docs. 09/06/2015 - League AGM and presentation - Ken Langston, Hon. Treasurer stands down. Presentation of trophies and awards for the various leagues and competitions took place at last night's AGM. The Hon. Treasurer, Mr Ken Langston announced he was standing down after 32 years in the post and was presented with a commemorative bottle of whisky. The presentation was made by the Hon. General Secretary, Tim Lane. M.Biddle Chairman BDCL Rules Committee. We now have a mailing list for members of Birmingham League teams to receive information and news of events taking place. Please contact the webmaster if you wish to receive an invite to join. I have now updated the details of clubs that play in the BDCL on the website. Each club has a page and it is up to club Secretaries to inform me of any errors or changes. Clubs can also send me items for inclusion that will help promote their club. Click on 'BDCL Clubs' link on the left.